Grease an 8-inch cake pan. Preheat oven to 350 degrees F.
Cream together the butter and the 1/2 cup brown sugar and 1/2 cup granulated sugar using an electric mixer. Sift together the flour, baking soda, salt, cinnamon, ginger, nutmeg, cloves, and cardamom. Add half of the dry ingredients to the butter mixture and mix in. Mix in the Greek yogurt and then add the remaining flour mixture. Pour the batter into the prepared cake pan. Place in the preheated oven and bake for 30 to 35 minutes. While the cake is baking prepare the caramelized bananas. In a medium saucepan melt the butter. Add the brown sugar, honey, and cinnamon. Cook over medium heat for 2 to 3 minutes stirring constantly. The sugar will thicken slightly. Add the bananas and continue to cook stirring the banana gently, so not to break them apart. Cook over medium heat for 1 to 2 minute or until they start to soften. 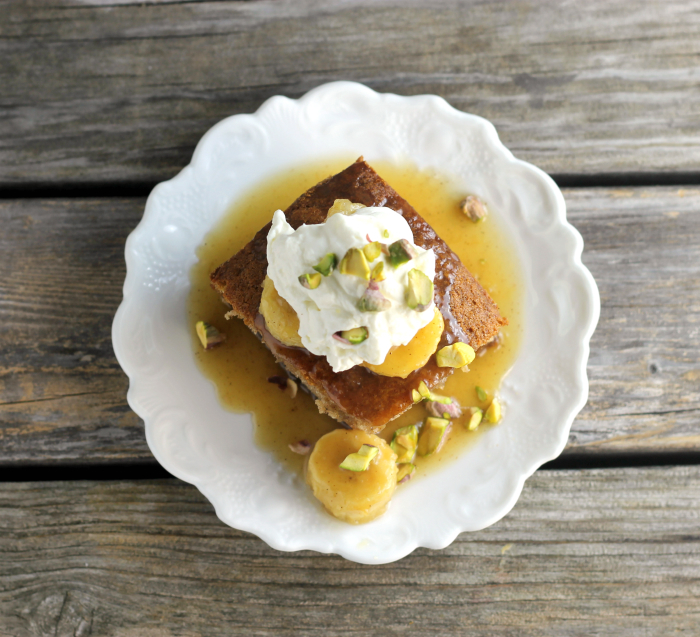 Place a piece of cake on a plate, spoon the caramelized bananas over the cake, then top with whipped cream and chopped pistachio if desired.